The bulk of the research at the Centre is carried out by the staff of scientific sections and their consultants, long-term visitors (staying for periods of 3 months or longer) and short-term visitors (staying for periods less then 3 months) engaged in independent or collaborative research, a relatively large cadre of post-doctoral fellows, and participants of ICTP's Associateship Scheme. Currently there are 30 staff scientists, 4 staff associates, nearly 60 post-docs and long-term scientists and 11 consultants. Each year the scientific sections host nearly 1000 scientists/students from all over the world for training and collaboration. In 2009, nearly 69% of the researchers came from countries that are developing on in economic transition, while the remaining 31% came from the industrialized countries. Twenty-one percent were women. 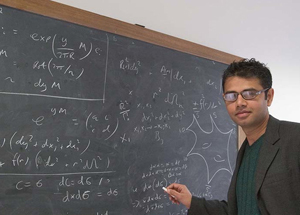 The following is a breakdown of the major fields of study in 2009: High Energy, Cosmology and Astroparticle Physics 13%; Condensed Matter and Statistical Physics 29%; Mathematics 10%; Earth System Physics 15%; Applied physics 33%; a Multidisciplinary Lab is focussed on interdisciplinary experimental activities. In 2009, the number of long-term visitors and post-doctoral research fellows totalled 89. They produced 106 scientific papers.